Set into a luxurious cove with a view overlooking a big grassy meadow full of white pines and poplar trees, the Pinery gives you a feeling of living in the alpines with high roof peaks and vaulted ceilings. This comfortable three bedroom home is a true favorite of Settlers Mountain guests because of all the amenities such as upstairs private master bedroom and master bathroom, open floor plan with kitchen bar, large solid wood dining table and huge rock fire place. Hand-crafted stone work by the Cherokee Indians surround this luxurious home, porch and working fireplace. There is a picnic table and barbecue grill. 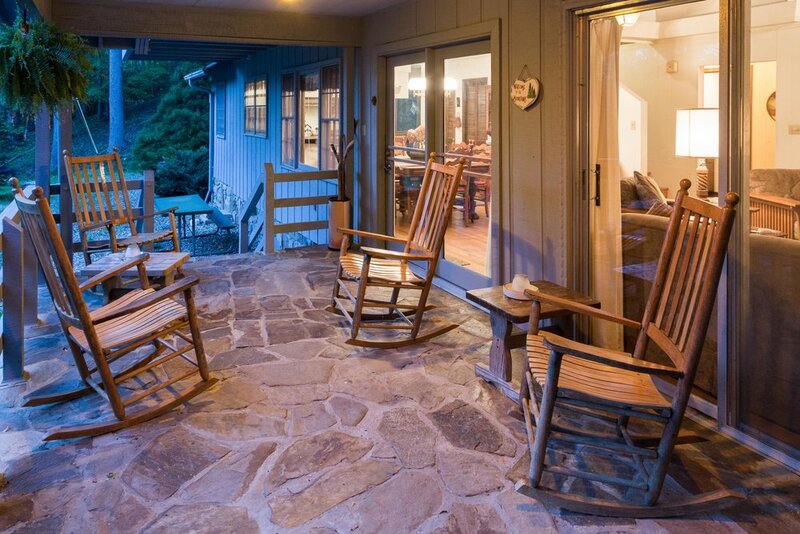 The front porch is graced with rocking chairs perfect for sitting with a cup of coffee watching for deer, birds or whatever woodland creature may pass your way. The Pinery will soon become one of you favorites too. Your have a wrap around covered front porch. Relax on the swing or sit back in the rockers and enjoy watching the humming birds and other native species feed at the feeders. Your fully equipped kitchen comes with dish washer, microwave, coffee maker, tea kettle, toaster, pots and pans, cooking utensils, dishes and silver ware. In the kitchen is a table that seats six people comfortably. The whole cabin has natural wood paneling with hardwood floors and central A/C and heat. Enjoy free Wi-Fi / internet, satellite TV, DVD or VCR. There is a queen sleeper sofa in the living area with comfortable chairs and ceiling fan. Dinning table seats six. There are three bedrooms with ceiling fans, one has a queen bed and the second one has a king bed and the third has two twin beds with wood floors throughout. Clean linens are included. There are two full bathrooms, one has a full size tub with shower and the other with shower. Clean towels are provided. Your laundry room is equipped with a washer and dryer. RESERVE 7 or More NIGHTS AND RECEIVE A 10% Discount! Settlers Mountain is open March 30th to November 26th. 50% deposit required to confirm & hold your reservation: Bookings canceled at least 30 days before the start of the stay will receive a 100% refund. Bookings canceled at least 14 days before the start of the stay will receive a 50% refund. If reservation is cancelled less than 14 days prior to your arrival date, your deposit will be forfeited.